Take a 20 minute boat ride to Stingray City, and swim and feed wild stingrays! These rays are very safe, making this the number one tourist activity in the Cayman Islands. 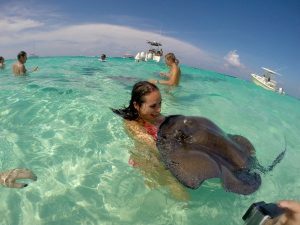 These stingray city tours are great for families and friends looking for a fun day on the water. 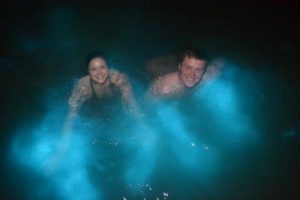 Grand Cayman is one of only a few locations world-wide where you can do a bioluminescence tour. This is a 2 hour excursion at night. Take a boat to the bioluminescent bay, and then you snorkel with the bioluminescence. You don't have to go into the water to see it, but the visibility of the "bio" is significantly better in the water with a snorkel and mask. Paddle boarding along the world famous Seven Mile Beach in Grand Cayman is one of the most popular activities. Stand up paddle board rentals are the easiest way to enjoy this activity. Private boat charters are a great way to see Grand Cayman. There are many things to experience, such as: Stingray City, Starfish Point, snorkeling at the Barrier Reef, Rum Point and the mangrove forest. 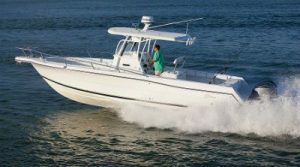 Click here for the best private boat charters Cayman Islands. Snorkeling in the Cayman Islands is a great way to see a wide variety of marine life. Cayman is famous for warm, clear waters, allowing for an amazing snorkel experience. Click to see the best snorkeling tours Grand Cayman has to offer. This excursion takes you to the barrier reef. This is the most popular spot on island, since it has a high density of coral and fish. Click here for the best snorkeling spots in Grand Cayman that are accessible from shore. Grand Cayman is great for fishing. Deep sea charters are a fun activity for the whole family. 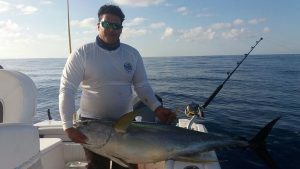 Fishing charters Grand Cayman are not to be missed. Explore the underwater world by diving. 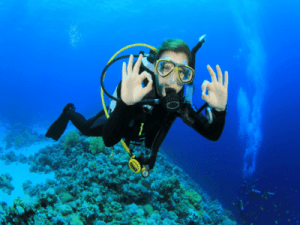 Grand Cayman dive operators are top of the line, and will make the experience easy and enjoyable. Ride horses along a secluded beach and through the warm shallow waters. 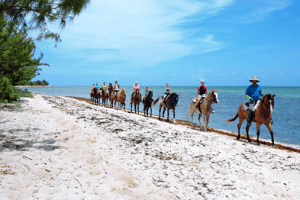 Take a fun horseback riding tour in Grand Cayman. This is great for both beginners and experienced people. 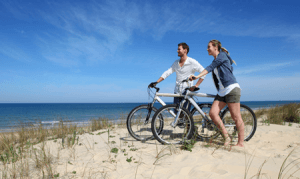 Explore the island on a high quality bicycle. Grand Cayman is very safe and the roads are in great condition, so renting a bike and cycling around the island is ideal for people looking for an active way to see new places. Click here for Grand Cayman bike rentals. The "Kittiwake" is an ex-US Navy ship which was purposely sunk off of Grand Cayman's Seven Mile Beach in 2011. This is now a popular dive and snorkel site. Click here to learn more about the Kittiwake Grand Cayman. 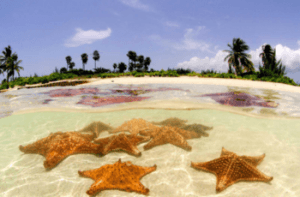 Starfish Point Grand Cayman is a secluded beach about an hour drive from Seven Mile Beach. There is a high number of starfish that inhabit these shallow waters. People go here to hold and take pictures with the starfish, but make sure you keep the starfish in the water at all times. View the island from the sky. This is the best way to see all of Grand Cayman. This adventure is perfect for thrill seekers. 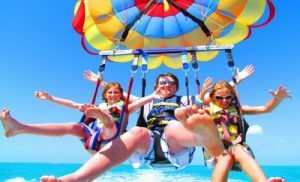 Check out Grand Cayman Parasailing here. You can hold baby turtles at the Turtle Farm. There is also a shark tank, crocodile, bird sanctuary and restaurant here. This is a great place for families and friends to spend a few hours whilst on vacation. 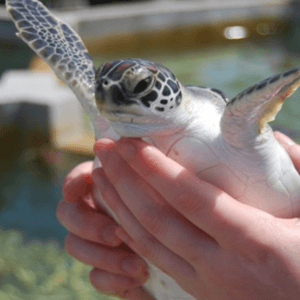 Click here to learn more about the Turtle Farm Grand Cayman. Cayman Crystal Caves only opened in 2016, and has fast become one of the most popular tourist activities in Grand Cayman. 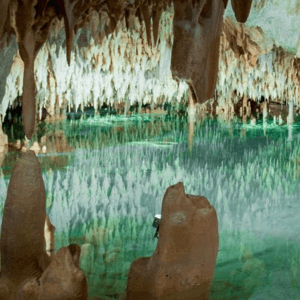 Click here to learn more about crystal caves Grand Cayman. Kitesurfing is great for people who are physically fit and love watersports. 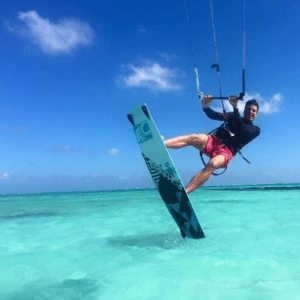 Click here to find out more about Kitesurfing Grand Cayman. 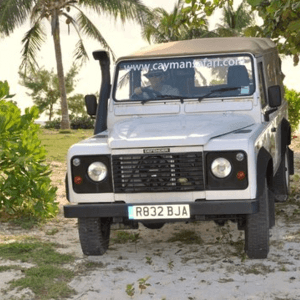 Explore the East side of Grand Cayman by taking a fun and exciting island safari tour. Click here to learn more about this Grand Cayman safari. 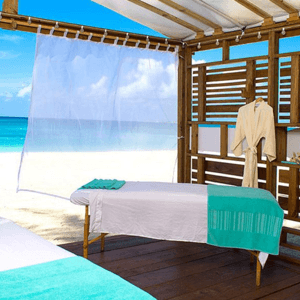 Enjoy a relaxing day at a luxury spa on Seven Mile Beach. Located at the prestigious Westin hotel, services offered include massages, oxygen facials and saunas. Click here to learn more about this Grand Cayman spa. 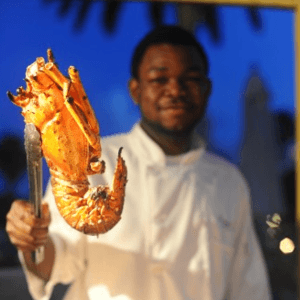 Visit multiple local areas in Grand Cayman for a varied culinary tasting experience. There is also an option to have a private farm-to-table local dinner experience, hosted by one of the island's top local chefs. Click here to learn more about this local food tour Grand Cayman. 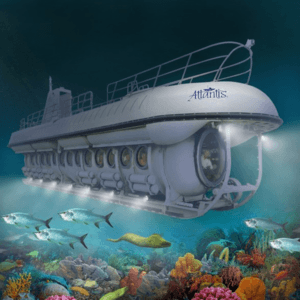 Explore Cayman's underwater world in a custom built submarine. This is a great activity for people who want to see marine life without snorkeling or diving. Click here to learn more about this Grand Cayman submarine tour. Play golf at an 18-hole championship course. Tourists are welcome here. This is a par 71 course and is 6605 yards. 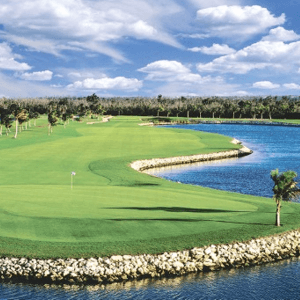 Click here to learn more about this Grand Cayman golf course. There are many activities to do in the Cayman Islands. We have compiled the best list of things to do in Grand Cayman above. Our local knowledge ensures that this list is kept up-to-date. The Cayman Islands is a UK over-seas territory. However, the island is mostly influenced by the USA due to its close geographical proximity. It is only an hour flight from Miami to Cayman. English is the native language. Most of the island's tourists are from the USA. Cayman is known for being extremely safe, which is why it is a popular vacation destination for families. Unlike more dangerous locations like Jamaica, you can roam freely, allowing peace of mind. There is still some crime, but crime levels are far lower than other Caribbean islands. Full-time population is only about 65,000. We receive about 2 million tourists every year. There are more cruise ship passengers than over-night tourists, however, the over-night tourists out-spend the cruise ship passengers. There is no heckling here; certain Caribbean islands will subject you to people trying to constantly sell you stuff, but not in Cayman. Poverty is almost non-existent due to the booming tourism and financial service industries. There are many hotels and condos that you can stay at. Most people enjoy staying at condos since there are less people there, and allow for a more secluded experience; however, hotels provide more amenities and assistance in the form of concierges etc, making hotels great for first time visitors who may not know what to expect. Grand Cayman is the main island in the Cayman Islands, and is really the only island worth visiting as a tourist. We hope you choose the Cayman Islands as your next vacation destination. We hope that we have summarized what to do in Grand Cayman in this list.